A skink is a lizard. There are approximately 600-800 types of skinks in the world, the most common skink for a pet being the blue-tongued skink. When purchasing a skink for a pet you should look for one that is alert and active. He should be curious with a well-rounded body and tail. His eyes should be clear and his nostrils and vent clean and clear. An adult ranges in size from 12-18 inches, with some varieties reaching as long as 32 inches. House your skink in an appropriate sized aquarium. An appropriate size aquarium will range anywhere from a 40 to 55 gallon tank. Several different types of medium are suitable for the bottom of your tank. Apply 3-4 layers of medium to the bottom of your aquarium. Consider sand, vermiculite, small gravel, coconut fiber and bark. Also include an area for them to hide, such as a hollowed log, cave or box. Spray your enclosure regularly to provide a moist environment. Clean your aquarium daily to remove feces. A regular weekly cleaning should be performed to keep your pet healthy. Remove your skink to a secure location. Remove all substrate and environmental features. Clean your tank with a bleach solution to kill any bacteria. RINSE WELL to remove the bleach smell. Cleaning all your tank features is important to ensure your pet’s health. Remember to wash your hands thoroughly after contact with your skink and aquarium to avoid the possibility of salmonella. Keep a sturdy shallow dish in your skink tank that can’t be tipped over. This water should be changed daily with non-chlorinated water. Your pet will use this for cooling himself as well as aiding his shedding process. Skinks eat crickets, mealworms, vegetables and meat. Provide live insects as these are preferred by your pet. Dust them with an approved vitamin/mineral supplement to provide optimum nutrition. Your pet’s tank should be large enough for him to get enough exercise to keep him healthy. 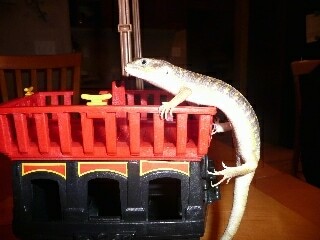 Your skink will also get exercise when you take him out and handle him. Branches may be used but are not necessary in your pet’s tank. Skinks are ground dwellers but CAN climb. Be sure to keep your tank lid secure to avoid a possible escape. Depending on the care you provide to your pet, a skink may live 15 years or more. Please be a responsible pet owner and consider your pet’s life expectancy before purchase. Mucus in its nose or mouth. Bumps or sores on the skin. Generalized swelling in limbs or tail. Paralysis or malformation of limbs or its tail. Loss of interest in surroundings and food, or underweight. Gestation periods vary according to variety. Ranges run from 50 days to 8 months. Skinks are viviporous, meaning their offspring are born live. 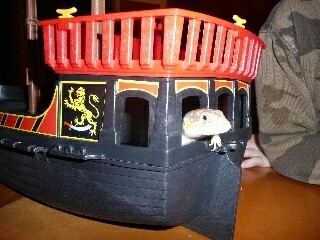 "This is my pet lizard Freckles. He is very friendly and likes to play. He is an Egyptian skink. He likes to eat mealworms and bananas. Sometimes he will jump to me from a table. He is my best buddy!"